The room was hot, and humid, but the old man would not turn on the air. He said that it cost too much money. The fact that this was Miami and July made no difference,that ancient swamp cooler remained silent in the living room window. To emphasize his granite determination to deny Florida Power and Light an extra penny, Chum dressed each morning in long pants, a belt, and a long sleeve shirt, cuffs buttoned. Mont Chumbley did not project the South Beach image favored by the city’s Chamber of Commerce. However his strict rules of economy were cast aside the summer I flew down to record his story. And I do mean record, as in tape recorded interviews which lasted, in all, five days. And when I needed quiet the most (for quality purposes,) he decided to switch on that neglected, thundering swamp cooler, providing a Phil Specter-esque ‘wall of sound’ which muffled his fascinating story. We were both nervous. I hadn’t been married to his son long, and my husband hadn’t come along on this trip. It was just the two of us: new father-in-law talking with new daughter-in-law. But I couldn’t let the awkwardness get in the way, I had traveled three time zones to get the story, and we had to soldier on despite our mutual jitters. I hit record on the tape player, and immediately he began anxiously whacking a nearby phone book with a pencil. We now had a beat to the swamp cooler’s roar. And he did that for my comfort. How courteous. I tried to play back the sessions right away to transcribe the contents. It’s safe to say that deciphering his voice from the background clatter grew to be a problem. Imagine the musical “Stomp,” with people trying to converse over crashing trashcan lids. After a couple of days of this fidgeting he settled down, and to be completely honest, I did too. Chum even forgot to turn on the air once or twice. And his story in aviation began to unfold, carrying us away from noisy appliances; to days before there were such things as air conditioners–to the skies of another era. One story that made it into the book tells of his hair raising landing on the infield of a Maryland horse track. Later I had to hit the replay button a half dozen times to get the name right, listening hard to his phonetic pronunciation, buried beneath screeching layers of white noise. Shaped by his Virginia drawl, I deciphered, Har-Day-Graw. I typed HardayGraw into a search engine. “Do you mean Havre de Grace?” quickly popped up . Hmm. Well, I guess I do. Maybe. 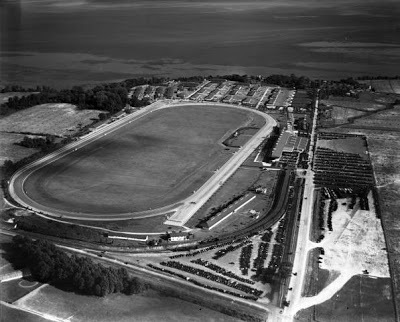 Lo and behold, Havre de Grace was a horse racing track between Washington DC and Philadelphia, tucked into the Maryland countryside. The web site indicated that this track evolved as a joint venture, owned partly by the town of the same name, and partly by the mob. Partly by the Mob? Are you serious? And everybody knew? I had to look a little deeper. Apparently in an agreement with the Governor of Maryland, and a former congressman, in a partnership with mobster, Arnold Rothstein, Havre de Grace came to life. And this was no small time nag fest, either. Among the thoroughbreds who graced, Havre de Grace were legends, Man ‘o War, his son, War Admiral, and the indomitable, Seabiscuit, You can’t make this stuff up. This entry was posted in Uncategorized and tagged "Night Flight, Air Carriers, air race, aviation, Gail Chumbley, Havre de Grace, horse racing, Man 'o War, Mont Chumbley, river of january, Seabiscuit.